If you own the PlantPure Nation cookbook, thumb quickly to page 225. The "Spicy Black Beans Over Rice" recipe is bursting with flavor and has JUST the right amount of heat. If you don't own the book, it should be your next purchase! This dish has the perfect balance of spices and ingredients. 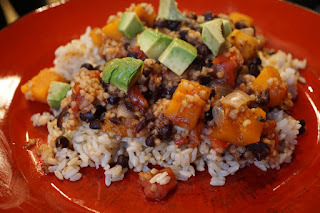 The spiciness level was perfect for me and Mr. Plant, but is easily kicked up a notch with an additional chile in adobo sauce (which makes this dish smoky and delish!) thrown in. 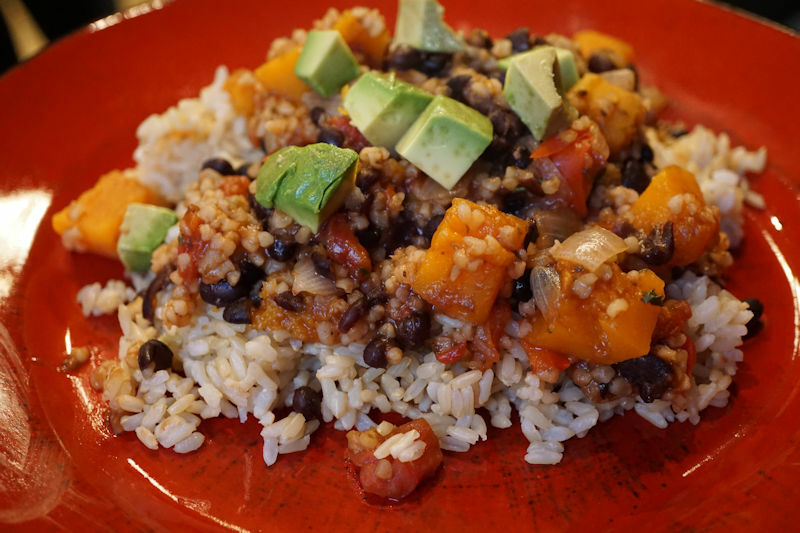 The ingenious blend of butternut squash, black beans, tomatoes, onions, garlic, red bell pepper, chiles in adobo sauce, bulgar wheat, veggie broth, cilantro, and spices over brown rice with a sprinkling of diced avocado has now topped our "Make This Again!" list. NOTE: I loved author Kim Campbell's tip to cook this in the slow cooker, which got me thinking. Could I make this in the pressure cooker? YES!!! I browned the chopped onions first with the saute feature of my pressure cooker, then dumped in all of the other ingredients except for the brown rice (which we had previously batch-cooked and frozen) and the avocado. EIGHT MINUTES LATER (with quick release), it was done! Thanks for the conversion to PC! I love, love making dinner in the PC! This is on my menu for this week. Patricia...You will adore this recipe. It is seriously one of the best meals we've had. Is the recipe posted? I can't seem to see a link if it is posted. I didn't post the recipe because it is directly out of a new cookbook and not posted anywhere online. It's on p. 225 of the PlantPure Nation cookbook. It's a fantastic book with healthy recipes! So glad you liked it! It's one of our faves!! !